Ruth Thompson, 88, of Harlan, passed away Wednesday, July 11, 2018 at The Cedars of Leo. Ruth was born in Mishawaka on October 17, 1929 a daughter of the late George & Laulah (Cunningham) England. Ruth was known for her delicious wedding cakes that she made at T & T catering. She was a loving wife, mother, grandmother and devout member of the South Scipio United Brethren Church, the Lady Bugs & Chatter Club. Ruth will be sadly missed by her husband, James whom she married May 14, 1949; children, Diane (Greg) Schneider of Cincinnati, Colleen (Mark) Lengacher of Fort Wayne, Jim, Jr (Connie) & Scott (Jamie) both of Harlan; siblings, Naomi White of Fort Wayne, Becky Moore of Butler & Paul England of Springfield, OH; 8 grandchildren & 6 great grandchildren. She was also preceded in death by her siblings, John & George England, Lois McCoy, Roberta Watson & Hope Christy. Viewing is also Friday, 4 - 8 pm Dooley Funeral Home, 202 W. River Street, Antwerp, Ohio. She will be laid to rest in Scipio Cemetery. Memorials are to South Scipio Church or Harlan Youth Center. Ruth Thompson was a woman of enduring faith and eternal warmth. Throughout her long and rewarding life, Ruth relished in the loving service of others enthusiastically lending her hand to those in need. With unwavering faith, Ruth thrived in the face of life’s greatest challenges, while cherishing each moment she shared with those she loved. A devoted wife, mother, and grandmother, Ruth never shied away from hard work and her kind spirit inspired all who knew her. Cherished by many, she will be forever missed by all who were blessed to share her life journey. The beginning of 1929 continued to ride the decade’s roaring wave of peace, prosperity, and hope. The nation celebrated the recent inventions of Penicillin, the iron lung, bubble gum, and the Yo-Yo. As the wave of sweeping social and economic growth rapidly increased, nowhere was their more hope for the future than in Mishawaka, Indiana as George & Laulah (Cunningham) England welcomed their daughter Ruth into their hearts and home on October 17. Despite the obvious and typical challenges of growing up in the wake of the Great Depression, the England family leaned into their faith and family values, ever certain of the goodness in others. Ruth was raised in Fort Wayne until the 8th grade when her family moved to Harlan. There the family rooted themselves in their faith community and sharing their gift of song. Ruth and her siblings sang together at many of the area churches, inspiring much joy for those who were lucky enough to witness the beauty of their collective voice. While Ruth’s father provided for the family through his work at General Electric, her mother worked as a homemaker. During high school, Ruth wrote for the school newspaper. She had a knack for note taking and proved a valuable member of the team. Her talent for catching essential details and significant events became a lifelong habit. It was quite common for her family to see her documenting their history in picture books over the years. She especially enjoyed keeping the score of her beloved IU basketball games. Her Hoosier Pride was unrivaled. Ruth married her sweetheart and fellow Harlan High School student, James “Jim” Thompson, on May 14, 1949, at the old Harlan United Methodist Church. They celebrated their nuptials with family and friends with a reception in the Harlan High School cafeteria. Thus began their 69-year adventure. Together, the happy young couple created a home on a local dairy farm. In time, they were blessed with the births of their four children. Diane, Colleen, Jim, and Scott who were Ruth’s greatest joy. She relished in creating a loving home for her family and raising her children with a clear and unwavering sense of faith. While the responsibilities of the farm kept the family busy, they managed to spend some much-deserved leisure time at the lake every Fourth of July, but they always had to be home for chores. Christmas celebrations were rich in family tradition; including wonderful food, gift giving, and always taking a family picture. Ruth made a lot of Happy Birthday Jesus! cakes. Once the children were grown and off creating their own beautiful families, Ruth and Jim began traveling more. They traveled often to wherever the National Dairy meetings were being held and proudly represented Allen Dairy INC. based in Fort Wayne. Not only were they able to represent their local dairy producers at the conventions, but they were also able to explore many of the country’s wonders. Trips to Alaska, Hawaii, and Washington State proved some of the most memorable. After many years of hard and passionate labor on the farm, retirement afforded Ruth and Jim the freedom to spend a month in Florida each year. Their southern month was spent in the good company of many good friends and daily golf games. They also enjoyed spending as much time as they could with their beloved grandchildren. Ruth’s grandchildren were her heart’s delight. In each of their eyes, she easily saw the spark of her legacy and her best dreams for the future. She loved Tracy, Alison, Angela, Kate, Matt, Kari, Adam and Andy with all her heart. She loved and enjoyed visits from her great grandchildren Karson, Mason, Mallory, Gustin, Kinsley, and Abram. Ruth was well known in the community for her delicious wedding cakes. For a time, she and Viola Thompson ran a catering business called T & T Catering. Many a local celebration was enhanced by Ruth and Viola’s love infused meals and treats. Family celebrations, especially birthdays, were so much sweeter because of Grandma’s artful confections. Her children and grandchildren will long treasure the beautiful cakes she so lovingly created just for them each year. Always searching for ways to lighten others’ burdens, Ruth was very active in her card ministry. Her kind words and thoughtful gestures made a tremendous difference for many. Daily reading of The Guide Post and Bible, as well as her membership in the South Scipio United Brethren Church, fortified Ruth’s faith which she truly embodied. She loved unconditionally, practiced forgiveness, encouraged peace, and remained humble. She listened with empathy, gave freely, and was often a safe place for others to simply be. With a radiant smile, twinkling eyes, and generous heart, Ruth lovingly welcomed everyone into their home. Without a doubt, life feels duller without Ruth’s brilliant light. She always wrote “Jesus Loves You, and So Do I,” in every card she sent and she really meant it. We can take deep comfort in knowing we can continue to share the beautiful legacy of this good woman in our own daily lives. Ruth Thompson, 88, of Harlan, passed away Wednesday, July 11, 2018, at The Cedars of Leo. 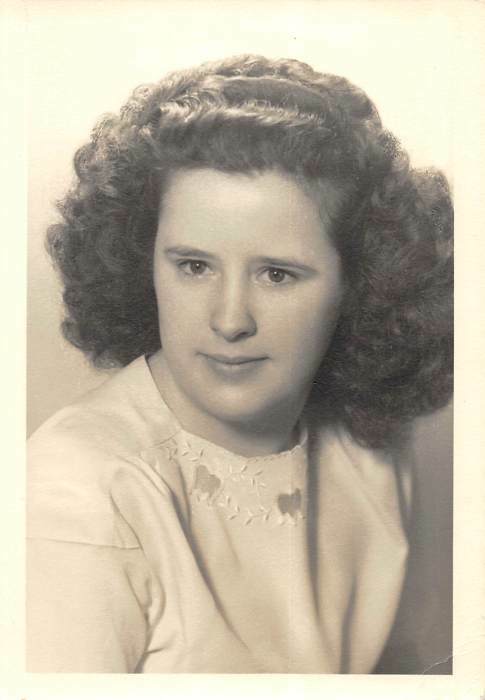 Ruth will be sadly missed by her husband, James; children, Diane (Greg) Schneider of Cincinnati, Colleen (Mark) Lengacher of Fort Wayne, Jim, Jr (Connie) & Scott (Jamie) both of Harlan; siblings, Naomi White of Fort Wayne, Becky Moore of Butler & Paul England of Springfield, OH; 8 grandchildren & 6 great-grandchildren.